The Hannon Laboratory relocated to the CRUK Cambridge Institute from Cold Spring Harbor Laboratories in late 2014. Our laboratory works to understand breast cancer from its earliest stages through to lethal metastatic disease. The strong focus of the Hannon laboratory on small RNA biology, and in particular the discovery of the protein components of the miRNA pathway, fuelled the development of artificial short-hairpin RNAs (shRNAs) as a tool to robustly knock-down gene expression in vivo (Paddison et al., Genes Dev, 2002). Over the years, we have improved the shRNA system considerably, improving the efficiency and reducing off-target effects through the production of better vectors and protocols and, more recently, the development of algorithms to predict which sequence can best target a given gene (Knott et al., Mol Cell,2014). 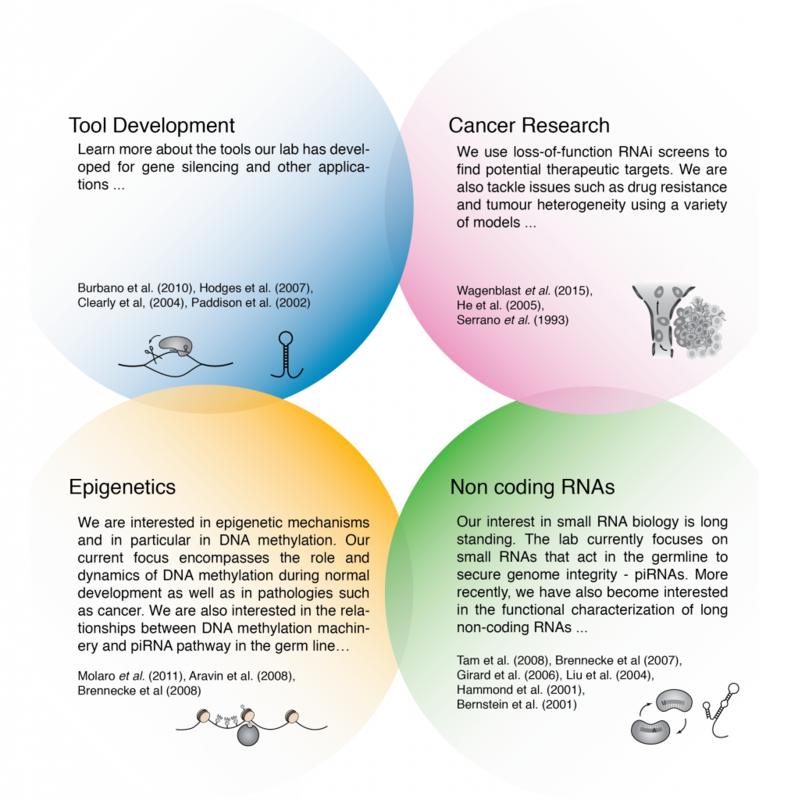 Figure 1: We work on a few different areas from basic RNA biology to cancer research and development of new technologies. Our projects often span more than one of these areas and usually require an interdisciplinary team. We were the first to develop in-situ oligonucleotide synthesis on microarrays as a way to generate complex oligonucleotide libraries (Cleary et al., Nat Methods, 2004), a procedure which has since become commonplace. This, in turn, allowed the development of genome-wide shRNA libraries for several animal models, which are now publicly available and widely used (Silva et al., Science, 2008). Over the last 10 years, the laboratory has used these libraries to perform many genome-wide screens for genes involved in tumourigenesis, drug resistance and small RNA biogenesis. Recently, we are developing combinatorial shRNA libraries, which will allow to test pairwise combinations of a large number of genes for synergistic or antagonistic effects linked to cancer progression. The laboratory has also directed some of its efforts to the development of similar tools for CRISPR mediated knockdown. We are performing a screen to identify potent guide RNAs for a variety of genes, and try to infer the rules that make a target site more or less effective. Recently, our interest in tumour multiplicity and evolution has led us to devise strategies to uniquely label individual cells and trace their behaviour and lineage using DNA barcodes. We are currently working at several methods to generate barcodes, read them in vivo (possibly through some variant of in-situ sequencing techniques), analyse them, and use them as targets for intervention. We expect this approach to enable us to investigate both physiological (i.e. development) and pathological (i.e. tumourigenesis) events from a unique perspective. The Hannon lab seeks to address critical problems in cancer biology, focusing mainly on breast and pancreatic cancers. We study several areas of disease initiation and progression, including the characterization of early lesions in breast cancer and the behaviour of disease during periods of remission. We also have a particular interest in tumour heterogeneity and in mining the intrinsic phenotypic differences between subpopulations of cells in tumour models to identify critical pathways of disease progression (Wagenblast et al., 2015). In all of these contexts we apply a variety of cutting edge genomic and genetic tools to identify new targets for cancer therapy. The laboratory also includes a small team focusing on breast cancer research. 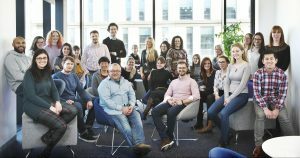 We are investigating a number of different questions using a combination of approaches involving imaging, low input RNA sequencing, lineage tracing and genetic manipulation. Many woman diagnosed with breast cancer do not die from their primary disease. Instead, and sometimes many years after initial diagnosis, they will develop spontaneous, rapidly advancing and often fatal metastasis. It is thought that this metastasis develops from cancer cells that have lain dormant in distant niches, waiting for the signals to activate and divide. What keeps these cells in their dormant state is unknown, as are the signals that cause them to start rapidly dividing again. Is it the cells themselves that control their fate, or is it the local environment surrounding the lone cancer cell? Our work in this area is attempting to answer some of these questions. Using a sophisticated microscope, capable of imaging and sectioning simultaneously, we are able to image throughout an organ and retain the tissue for later analysis. This enables us to locate and visualize the environment of single cancer cells that are sitting in a dormant state, having left the primary tumour, and allows us to profile the gene expression of these cells and their local area. 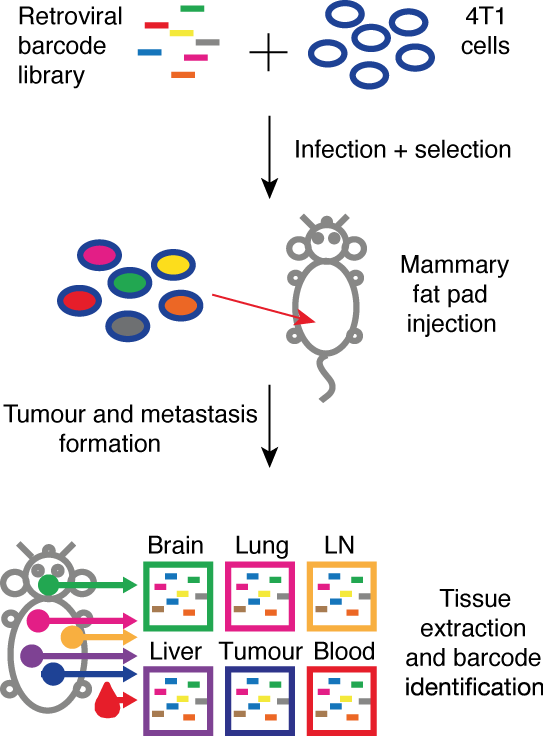 We are working on techniques to capture these cells and analyse their gene expression, allowing us to manipulate them in order for them to be either destroyed, or remain in their dormant state. The hope is that we will learn about how we can treat ALL the cells from a cancer. Ductal carcinoma in situ (DCIS) is often referred to as early stage breast cancer. Since these abnormal cells are localized to the milk ducts and technically still external to the body, they are not considered an invasive cancer. However this disease can progress, in approximately 50% of cases, to invasive ductal carcinoma (IDC), where cells have broken out of the duct and begun to invade the breast tissue, developing into one of many subtypes of breast cancer. One of the major challenges of this disease is identifying what causes some women to develop IDC where as others do not, and how best to treat woman diagnosed with DCIS to avoid over treatment. We are using a combination of laser capture microscopy, to isolate small, and specific areas of breast tissue with low input RNA seq to look for shared and distinct traits in this disease. The roles of different cell types within a cancer is vast. Certain immune cells, such as T-cells and macrophages have been shown to play a fundamental role in the development of a primary tumour, and in its ability to metastasise. I am interested primarily in the role of macrophages and how the cancer cells are able to shift the state of these cells, from one which would potentially destroy the cancer cells, to one that instead promotes cancer growth. Being able to genetically manipulate these cells in vitro has long been a challenge, my work has allowed the infection of bone marrow derived macrophages with shRNA expressing virus, enabling the manipulation of target genes to track their contribution to the pro-tumour fate of these cells. Cancers are typically made up of a collection of different cell types, each one working with the others to perfect the ability for the cancer to grow and spread. How these different cells function is not 100% known. Do certain cell types always form the primary tumour, while others always go on to metastasise, and others still evade standard cancer drugs? Or is it a random collection of driver mutations that create tumour heterogeneity? I am interested in how we can use the existing heterogeneity within a tumour to learn about predispositions a cell might have, and how we can use this knowledge to develop a new standard of care for cancer patients.